An aggressive, nonwoody, deciduous perennial vine that can overtake acres of vegetation, similar to kudzu, climbing over shrubs and trees. Leaves usually opposite (sometimes alternate toward branch tips), green, with 7-9 parallel veins, fiddle-shaped or heart-shaped, with pointed tip and two lobes near the base of the leaf. New growth often has a reddish coloration at the base of the leaves. Stems are round, slender, twining; plants usually die back to ground and resprout in spring. Flowers tiny, white to greenish-yellow, with scent of cinnamon. Male and female flowers are formed on separate plants, and female plants have not been observed in the wild in our country. Chinese yam is not known to produce seed in the United States, although bulbils, which resemble tiny Irish potatoes and are not technically fruits, are produced in the leaf axils. Stems: to 16 feet long or longer. Chinese yam becomes established in moist bottomland forests, along stream banks, drainages and roadsides, along fencerows, and at old homesites. It can grow in full sun to full shade but prefers partial shade. It is tolerant of most soil conditions, but it is most aggressive in silty loam soils rich in nitrogen, associated with riparian (river and streamside) habitats. 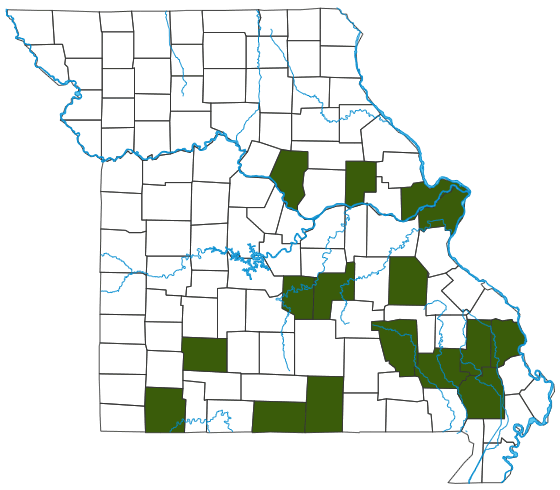 Currently in 16 counties in southern Missouri; it is found throughout the eastern and central United States. Invasive. An aggressive vine. Forms small bulbils (like little potatoes) in the axils of the leaves. New vines quickly sprout from these bulbils, which drop off the vine and are carried to new locations by water or rodents or in topsoil moved for construction purposes. Even a small piece of a bulbil will sprout into a new vine, the way a small piece of a potato can create a new plant. The bulbils can overwinter and form new vines in spring. Introduced from China in the 1800s for ornamental, food, and medicinal uses. Escapes from cultivation and aggressively smothers native plants. It’s still sold as an ornamental plant, but don’t plant it! Instead, select a beautiful native species such as native yellow honeysuckle or Dutchman’s pipe. These aggressive vines can overtake acres, shading out all other plants, shrubs, and even trees, eventually killing them. The weight of the vines can break tree limbs, similar to kudzu. It outcompetes and displaces native plants, reduces plant diversity, and is of little value for wildlife.